CHAPEL HILL, N.C. (AP) — Virginia Tech has had its top performances this season when playing on the road against Atlantic Coast Conference opponents. Throw in the fact the Hokies are coming off a loss, and Saturday’s trip to North Carolina looks like the kind of game that often brings out their best. Virginia Tech (3-2, 2-0 ACC) has earned both of its league wins on the road, first at Florida State to start the year and then at Duke on Sept. 29. 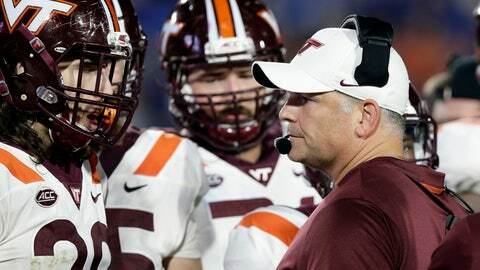 Those wins came by a combined 38 points, and they improved the Hokies to 7-3 in league road games under Justin Fuente. One of those came in their last trip to Chapel Hill, a 34-3 win against the Tar Heels in 2016 played in monsoon-like conditions from the remnants of Hurricane Matthew. Virginia Tech is coming off a 45-23 home loss to fifth-ranked Notre Dame, which knocked the Hokies out of the AP Top 25. A win against the Tar Heels (1-3, 1-1) will improve the Hokies to 9-1 under Fuente in the game following a loss. For North Carolina, it will be another chance to try to reset a problem-filled season. The Tar Heels started 0-2 and had a game canceled due to Hurricane Florence, then responded by showing some life in a home win against Pittsburgh. Yet they followed that by committing six turnovers in a 47-10 loss at Miami on a short week before heading into an open date. Saturday’s game will mark the first chance to see whether the Tar Heels have found any long-term answers. The Tar Heels rank among the Bowl Subdivision’s worst in turnover margin (minus-8), and three of their six turnovers were returned for touchdowns against the Hurricanes. The status of UNC quarterback Chazz Surratt is unclear. His mother, Brandi, said her son is set to have wrist surgery on Wednesday in what would be a season-ending procedure. Fedora — who typically doesn’t discuss injuries — declined to talk about Surratt’s status earlier this week. Surratt rotated with Nathan Elliott as the No. 2 quarterback against Miami in his season debut following a suspension for selling team-issued shoes and threw three interceptions — two returned for scores. Kansas transfer Ryan Willis has thrown for 641 yards with five touchdowns and one interception in two starts since replacing the injured Josh Jackson for the Hokies. Willis has the mobility to escape defenders, but he was stripped of the ball on a scramble for a long touchdown return against the Fighting Irish. The coaching staff spent the week reinforcing that he doesn’t need to try to do too much. Damon Hazelton has emerged as the Hokies’ go-to receiver and leads them with 27 receptions for 479 yards and five touchdowns. He’s caught a touchdown pass in each of their first five games, tying Isaiah Ford’s program record. And he had 12 catches for 131 yards and a TD against Notre Dame. Virginia Tech leads the ACC in red-zone efficiency, scoring on 18 of 19 trips inside an opponent’s 20-yard line with 13 touchdowns. Compare that to the Tar Heels, who have allowed opponents to go 15 for 15 with 11 touchdowns in the red zone this season.